They aren’t a real thing. The AOC (attestation of compliance) is a real thing. 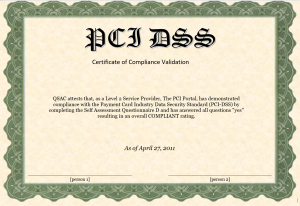 Please don’t ask your service providers for a certificate of compliance. You will make the PCI Guru angry. He correctly guides us to FAQ 1220 and thinks they aren’t worth the paper they are printed on (no thoughts if that extends to linking to them on your website though.) If you purport them to have any meaning, things will get ugly. And the council is very clear in the FAQ that they have no value and that only council supplied forms should be used for the purposes of compliance validation. They are usually pretty. They can have the date of the next required assessment on them. 2 reasons to hang them on a wall. Some people request them. They have been getting them for years and now demand them. (I know they shouldn’t). Uh, Maybe step #1 would be to get this document pulled down or amended before reporting QSAC’s to the council? (Doc is still online and Bing’s #1 result for relevant search terms as of April 2018). ← I am NISTy, do i still have to comply with password complexity requirement?